Brown rice is delicious. It’s nutty, wholegrain goodness is full of magnesium, phosphorus, selenium, thiamine, niacin, vitamin B6, an excellent source of manganese and high in fibre and although it takes a little longer to cook than white rice, it’s benefits are worth it. I recently discovered Basmati Brown Rice – can it get any better? Because of how long it takes to cook, I often cook double or triple what I need at once. That way I have left over in the fridge to use for fried rice, rice/fish cakes, or something simple with gravy and meat on the side. It really does help on those nights when you’re in a rush to get a good meal on the table as quickly as possible. I’m finding that the older my son gets, and the after school sport activities extend into the evenings, we’re sometimes only home by 6.30 or 7.20 pm, so having healthy pre-prepared options on hand is a life saver. I can’t be dealing with toasted cheese sandwiches as my only option, although he’d happily eat them 7 nights a week I think. 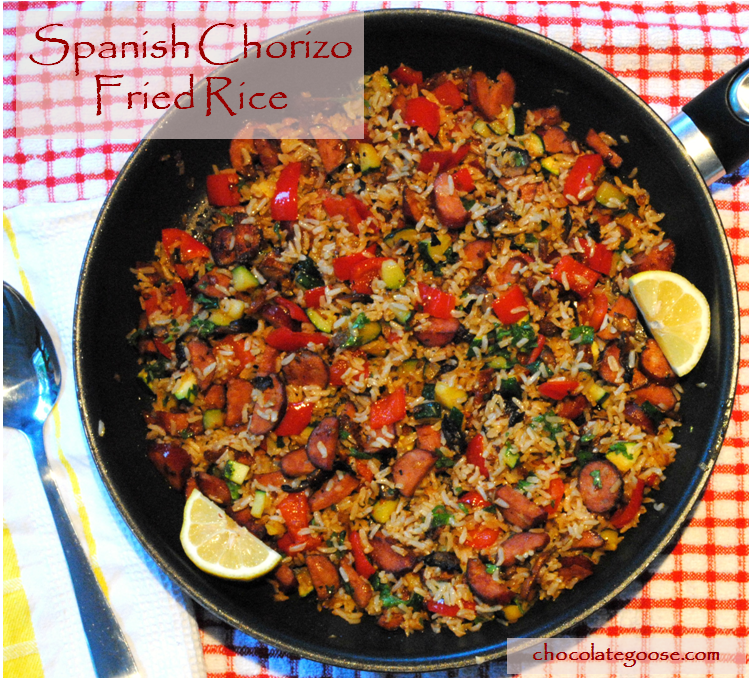 This dish is a great money saver too, as the use of chorizo sausage makes a little go a long way. My preferred local grocery store has really good quality mild or fully spicy ones for around $3 a pack (250 g), which quite easily makes this meal a very worthwhile option if you’re on a tight budget. Great for students too, plus the inclusion of a few chopped veggies helps use up whatever is lying about in the fridge and might be on it’s last legs. I made this the other night, and although it looks a little like Paella, I promise there isn’t a piece of fish or squid, octopus or mussel in sight. Also, I didn’t use any expensive spices like saffron. So the flavour comes from the rice (which I agree isn’t of Spanish origin), but the spicy chorizo I used is, so a great flavour, and meal, all round. Another reason I like having cold cooked rice in the fridge (and yes, I hear the voices in my head quoting magazine articles I’ve read about rice left in the fridge too long can develop all sorts of poisons in it, but people – honestly, leaving it for one or two nights is fine, leaving it for a week might be a different story altogether. As long as it is in a sealed container in the fridge at the right temperature, it will be fine for a day or two). So back to my point. Another reason I like having cold cooked rice in the fridge, is that this is the absolute best rice to use for stir fried rice. Freshly cooked rice that is still warm, is soft and sponge-like, and has just absorbed a lot of cooking liquid so when you try to fry it, your stir fry can become a little stodgy, like a badly made risotto. I prefer my stir fries to be crunchy and full of a range of textures from the crispy meat pieces, to the diced veggies, to the rice. Peel, chop and dice all ingredients as noted above, taking care to keep them separate from each other. Heat the oil in a shallow wide saucepan and fry the chopped chorizo and onion until the onion is translucent and the chorizo begins to caramelise. Add the garlic, red and yellow peppers and stir fry for a few minutes. Then add the diced courgettes and after 2 – 3 minutes, add the cold, cooked rice. Remove from the heat and season with salt and pepper. Pour over the lemon juice and sprinkle over the chopped fresh herbs.